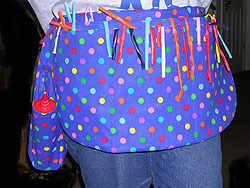 This quality accessory, fashioned from durable, heavy-weight cotton, features nine deep pockets (two rows of three in the front and three on the reverse side), which provide great versatility in arranging balloons either by color or type. Also included is a matching pump holster, which can be attached to either side. It's also machine-washable, ensuring many years of service. This versatile prop perfectly combines mystery and comedy. The performer turns the bag inside out five different times and each time, it changes its appearance. A zippered compartment is sewn into the final layer for productions, etc. Professional quality and size (11" square). SEAMS LIKE MAGIC can customize or create any item of clothing for your specific needs or specialty act. Topits, in both the Ammar and Cloutier styles, can be added to your suitcoat, sportcoat or vest. Even unusual requests (such as the conga sleeves pictured at right) can be accomodated with ease. SEAMS LIKE MAGIC can create customized banners for promotions, trade shows, stage presentations, etc. Once again, contact us for a quote!